I had carrots sitting in my refrigerator for sometime now. I had actually bought them when my father-in-law was visiting and had intended to roast them. But with working the days that he was visiting I never found the time to make them. So it was time to use them up, they had sat in the refrigerator long enough. So that got me thinking I wanted to make something a little different, that is when I thought of carrot bread. I started looking for a recipe and found one in my Joy of Cooking 75th addition that sounded quite good. I did jazz it up with a couple of more spices. The recipe called for some cinnamon and I decided to add some ginger and nutmeg for a little more pizzaz. 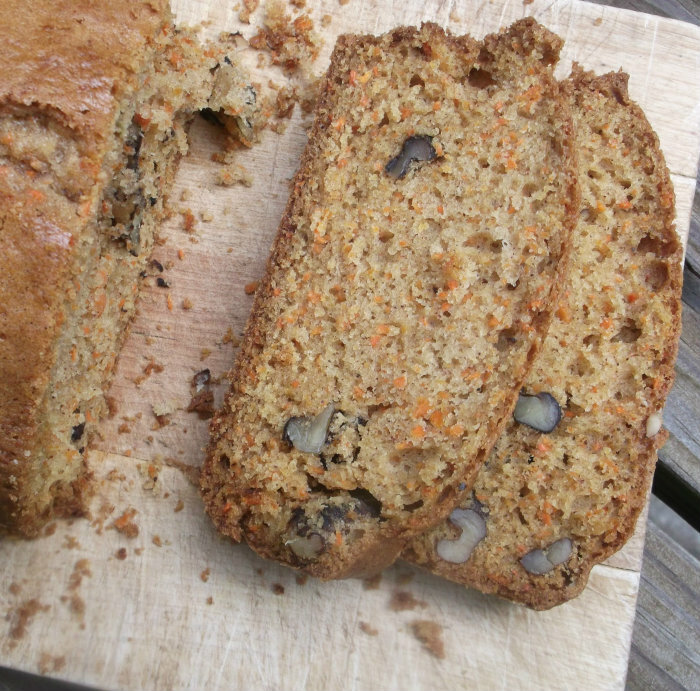 The ginger and nutmeg were good additions to the bread, I think they went well with the carrots. I liked that there were flecks of orange throughout the bread, it made it very eye appealing. Our daughter and granddaughter came for a visit the day that I made this bread and my granddaughter loved it. She will be turning a year old next month and she is starting to eat a lot of different foods, so it was fun to see her enjoying this bread. Whisk together the flour, baking soda, baking powder, cinnamon, ginger, and nutmeg in a medium bowl. In a large bowl blend together the sugars, eggs, oil, vanilla, and salt. Stir in the dry ingredients and blend with a few swift strokes. Scrape the batter into the greased pan. Bake until the bread pulls away from the sides of the pan, about 40 to 45 minutes. Cool in the pan on a rack for 10 minutes before unmolding to cool completely on the rack. We’re big fans of quick breads around here. They’re easy to make and really are perfect to eat any time of the day. Can’t wait to try this one. Lovely carrot bread! I think I also have dying carrots in the fridge now. Excellent idea! I like to experiment with breads. One with carrots is a must. Those flecks of orange in the bread really are so attractive. And the recipe looks terrific, too – I’d definitely enjoy this. Although I like carrots any which way, roasted included. Thanks for this. What a scrumptious carrot bread! Love all the warm spices. I bet your granddaughter is adorable! 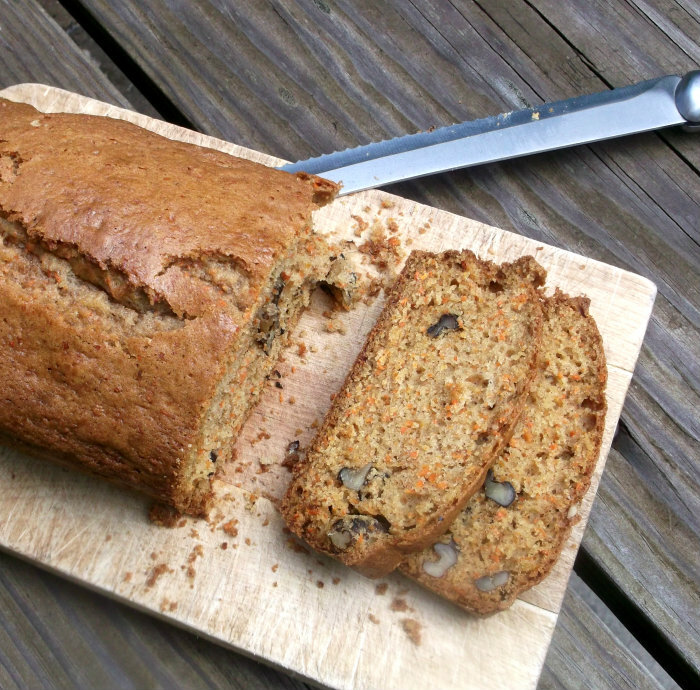 I haven’t made carrot bread for so long – this looks delicious!